The Hungarian National Trading House Cls is currently present in some 40 countries, including the United States, Brazil, Chile, China, Indonesia, Israel, Iraq, Jordan, South Africa and the United Arab Emirates. Canada will soon join this growing list. The organization notes: “Our strategic objective includes the opening of further trading houses in the Carpathian Basin and expansion, within the framework of the policy entitled “Opening to the South,” in the South American region as well. The Orbán government’s policy of “Opening to the South,” which has raised eyebrows among foreign affairs and foreign policy efforts, has already involved the opening of a Hungarian embassy in New Zealand, as well as an agreement with Kenya, in which Prime Minister Viktor Orbán’s government commits to bringing 50 Kenyan students to study at Hungarian universities on scholarships each academic year. In exchange, Hungarian companies can play a central role in four important areas of Kenya’s economy: the manufacturing of vehicles used in public transport, water filtration, agricultural machinery and medical supplies for hospitals. Hungary’s state-owned Eximbank is providing $70 million in loans to Hungarian companies that want to enter the Kenyan market. The Orbán government has also launched a strong economic push in Canada, especially since 2014, when Péter Szijjártó took over as Foreign Minister and made international trade his priority, and after Ambassador Bálint Ódor replaced his predecessor, László Pordány, and also emphasized stronger economic ties. Ambassador Ódor gave an interview this month to Ottawa Life magazine, and noted: “Hungary has always been a very innovative country. I think the future between Canada and Hungary is very much in the field of research and development.” He added that historically this trade focused on medical equipment, pharmaceuticals and machinery, with trade between the two countries totaling $634 million in 2012. It was under the Ambassador Ódor’s tenure that Air Canada Rouge launched direct flights between Toronto/Montreal and Budapest, following Air Transat flights established in the previous year. Air Canada was the main corporate sponsor behind Hungary’s Cultural Week in Montreal. 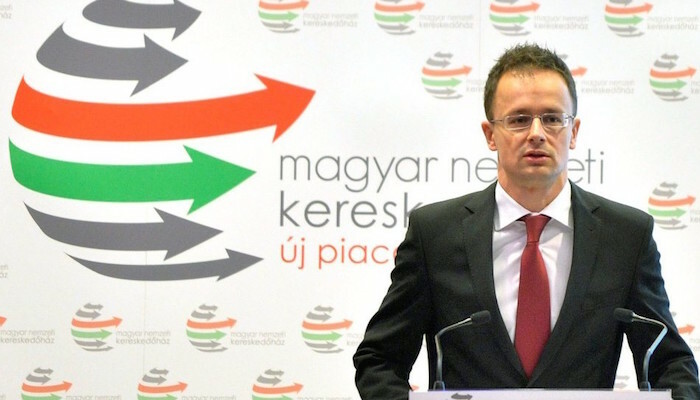 Minister of Foreign Affairs Péter Szijjártó, standing in front of the banner of the Hungarian National Trading House. The opening of a Hungarian National Trading House office in Canada is part of this strategy, but the opposition in Hungary has been raising concerns about the growing losses that are being amassed by the Ministry of Foreign Affairs, through these ventures. In July, the Democratic Coalition demanded that Mr. Szijjártó explain these losses. More than $28 million in public funds was spent on opening new Hungarian National Trading House offices abroad over the past 18 months. Yet these offices have only managed to generate $13 million in business. The Democratic Coalition has called on Foreign Minister Szijjártó to resign and has demanded that the Orbán government suspend the whole network of Hungarian National Trading Houses. But the liberal opposition party is not the only one to sound the alarms about the Hungarian National Trading House Cls. The Politics Can Be Different green party (Lehet Más a Politika – LMP) tried, in vain, to obtain clear information on the budgeting around the Hungarian National Trading House Cls. “The secrecy is explained by those news pieces which assert that the Hungarian National Trading House Cls, under the supervision of the Ministry of Foreign Affairs and Trade, has funded the relatives and confidantes of people close to the government. While the government policy of opening to the east is in ruins, and trade has actually decreased in the majority of target countries, the National Trading House provides a monthly apanage to the government’s discredited people,” remarked Erszébet Schmuck, an MP with LMP. The conservative Magyar Nemzet daily was among the first to begin asking questions about corruption around the Orbán government’s Hungarian National Trading House Cls. 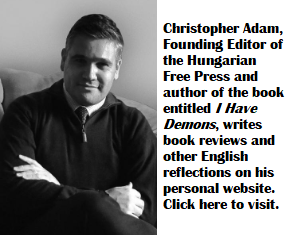 It appears as though a relative of György Matolcsy, Governor of the Hungarian National Bank, and a confidante of András Giró-Szász, a former government spokesperson, both profited from the Hungarian National Trading House Cls. Mátyás Matolcsy served as an adviser to the Hungarian National Trading House Cls for two and half years, collecting some $48,000 for his consulting work. Zoltán Lengyel, a former Fidesz politician, also managed to get onto the payroll of the Hungarian National Trading House Cls. Mr. Lengyel was hired as a consultant and collected a monthly salary of $3,800. Petra Hajdú, who previously worked for former Fidesz spokesperson András Giró-Szász as his press agent, also landed a job with the Hungarian National Trading House and makes $4,800 per month. Ms. Hajdú is now based in Colorado and refused to answer media queries, when she was initially contacted for comment. As the Hungarian National Trading House prepares to establish operations in Canada, Canadians and Canadian companies looking to partner with the Hungarian state should ask questions about the corruption allegations that encircle the organization. Trade exactly what? Art treasure? They have purchased a lot, who would do that kind of shopping before securing their customers? Waiting for the worldwide financial reset? Whats next, rendering a large scale of trade activities under diplomatic immunity? What are embassies for? Do I have conspiracy theory or I see the future? If Trudeau takes his exceptional chances that historical times we live in offers him for the oncoming few weeks, and takes a big step ahead that everyone expects him to do, than it really worth for the H government to make a real big opening in Canada. We will see. The corrupt trading deals, run by corrupt political insiders is even more blatant in the Middle East, where the turf has been divided up between the Fidesz and the Socialist Party. Orbán’s daughter, and Orbán’s son-in-law, are once again directly involved. The corrupt enterprise is set to be unleashed on Canada. See the following URL about the incredible Middle-Eastern entanglement. I hope the RCMP will keep a close eye on the Canadian scam, that Péter Szijjárto is about to unveil on his next visit to this country.